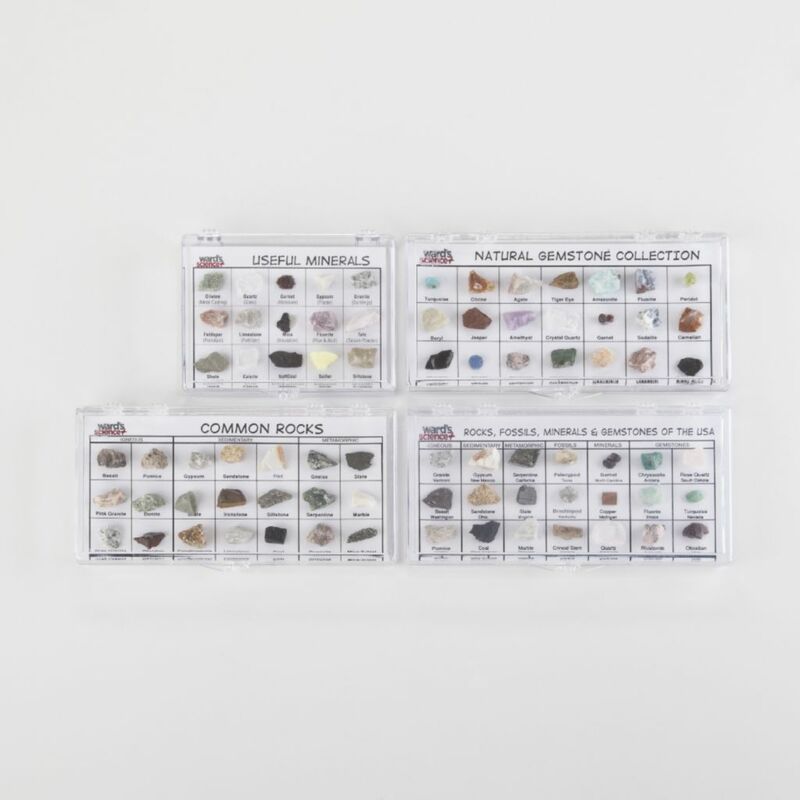 Colorful specimens, 1/2 - 1” in size and housed in a clear plastic box perfect for hands-on examination or display, are permanently mounted on a sturdy card stock, with specimen names on the front and background information on the back. 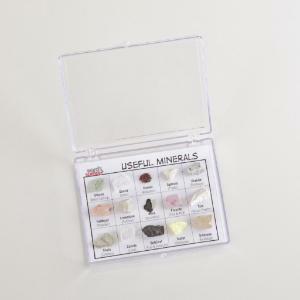 Twenty-one colorful gems used for lapidary and jewelry products are included in this set. 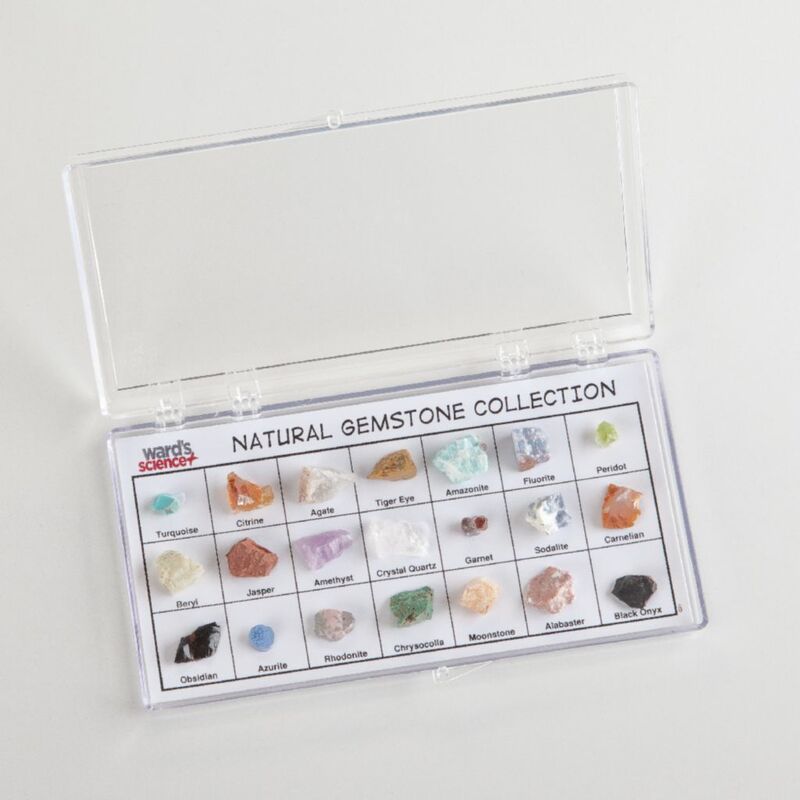 Size: 7”L x 3 1/2 ” W x 3/4 ” H.
Contents: agate, alabaster, amazonite, amethyst, azurite, beryl, black onyx, carnelian, chrysocolla, citrine, crystal quartz, fluorite, garnet, jasper, moonstone, obsidian, peridot, rhondonite, sodalite, tiger eye, turquoise. 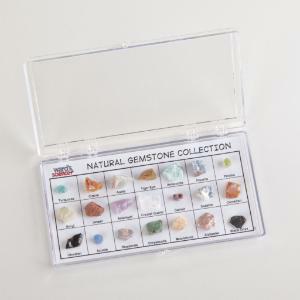 The set contains samples from each of the three classes of rocks; 21 in all. 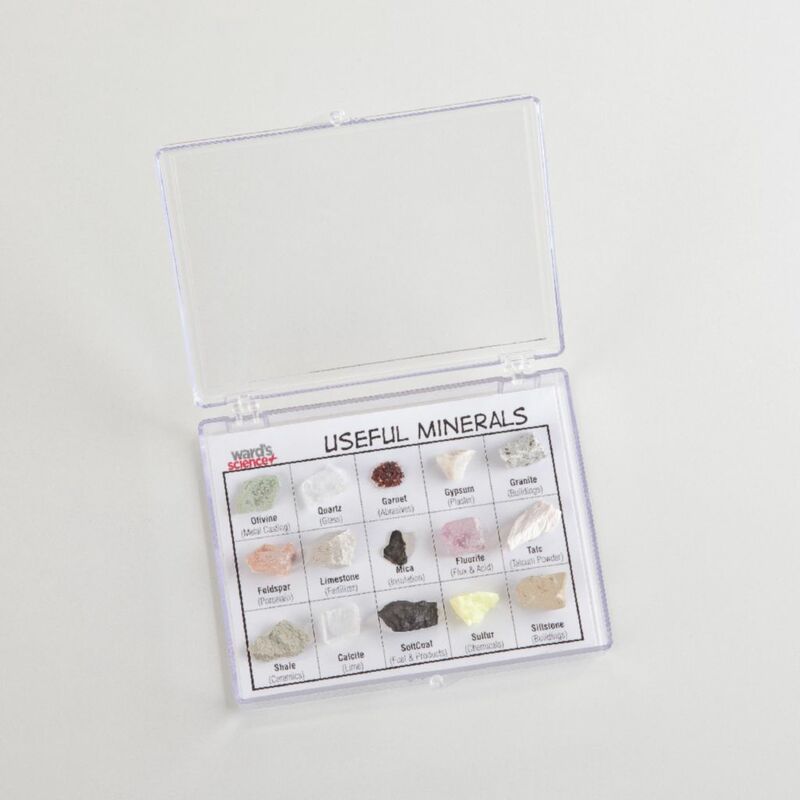 Size: 7”L x 3 1/2 ”W x 3/4 ” H.
Igneous: basalt, dunite, gray granite, pink granite, obsidian, pumice; Sedimentary: coal, conglomerate, flint, gypsum, ironstone, limestone, sandstone, shale, siltstone; Metamorphic: gneiss, marble, mica schist, quartzite, serpentine, slate. 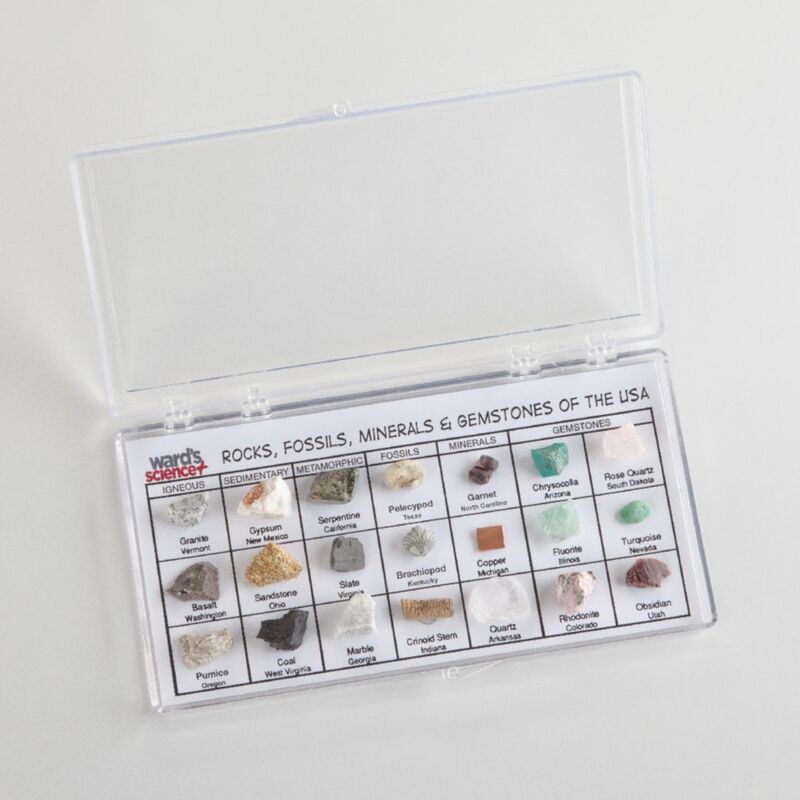 A true survey set, it contains 21 key specimens from across the U.S. The locality is identified for each. 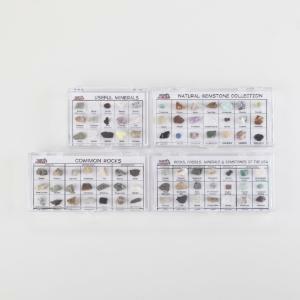 Size 7”L x 3 1/2 ”W x 3/4 ” H.
Rocks: basalt, coal, granite, gypsum, marble, pumice, sandstone, serpentine, slate; Fossils: brachiopod, crinoid stem, pelecypod; Minerals: copper, garnet, quartz; Gemstones: chysocolla, fluorite, obsidian, rhondonite, rose quartz, turquoise. 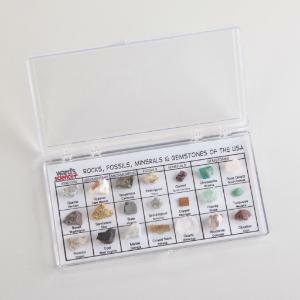 All four rock and mineral display sets for one economical price.